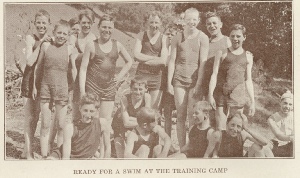 For the summers of 1918 and 1919 the summer training camp moved from Warner Canyon in Mill Valley to the Howard Estate dairy ranch outside the town of Olema in the Bear Valley area at Pt Reyes. 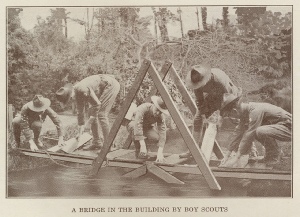 Through the courtesy of the Shafter and Howard families, a large section of the ranch was made available for Scout camping. 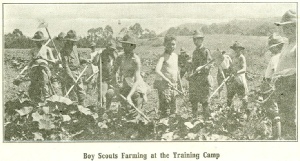 Nearly four hundred boys and their leaders participated in a daily program of instruction in first aid, signaling, agriculture and other special subjects. 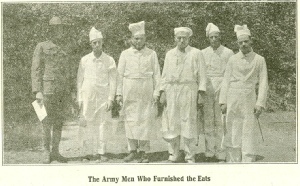 Tents were setup in a large laurel grove and semi-permanent buildings were constructed including a large field kitchen, store-house latrines, store and a post office. The water in a mountain stream was made available for swimming by means of a well built dam. During their free time the boys roamed to their hearts content in the famous Bear Valley area adjacent to the camp. 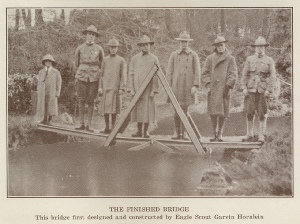 The Shafter and Howard families owned most of Point Reyes for 82 years, from 1857-1939. At the height of the Shafter and Howard empire, 31 dairy ranches were in operation. During that time, the operation of the ranches changed little, except for modernization in technology and transportation. 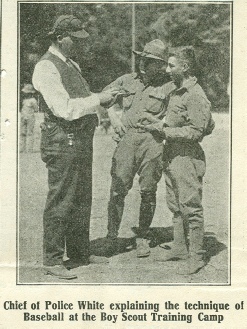 However with the eventual sale of the ranches starting with the Hart Hill ranch in 1919, the scouts would require a new location for their summer camp operations the following year.